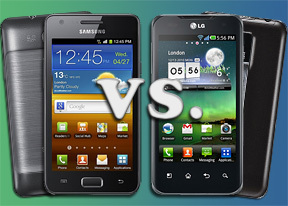 Both the Samsung Galaxy R and the LG Optimus 2X are powered by Tegra 2 chipsets, but they are not completely identical. The Galaxy R has double the amount of RAM - 1GB. We don't expect to see a vast divergence in CPU-oriented benchmarks, but it should make a difference to overall performance. We should note that the tests were done with both phones running Gingerbread. BenchmarkPi and Linpack focus on the processor cores and the two phones end up trading victories. The Galaxy R takes the BenchmarkPi round by a slight margin, while the Optimus 2X surprisingly comes ahead with a decent lead in Linpack. Both phones have the same NVIDIA-made GPU and render graphics to the same resolution. The Samsung Galaxy R however manages to come ahead in this test - maybe we're finally seeing the advantage of the extra RAM kick in. We expected the Galaxy R to be the clear winner here, since both phones are powered by the same chipset except for the R having twice the amount of RAM. Yet the only test that the Optimus 2X lost was the 3D rendering test. Still, both phones held up admirably when compared to some high-end dual-cores. The two smartphones are virtually identical in terms of audio output when no headphones are attached. The differences are so small that they are barely detectable even in lab conditions, let alone by ear. The volume levels of the two are quite similar, too, so you should know that both the Samsung Galaxy R and the Optimus 2X will do an equally great job of streaming to your car audio or home stereo. 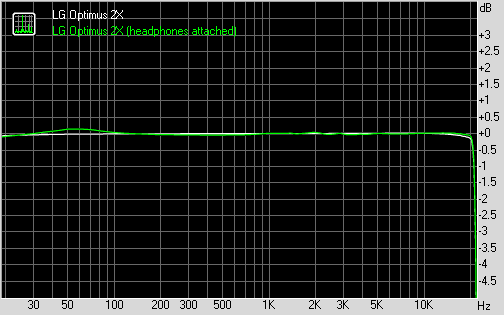 Differences do appear when you plug in a pair of headphones, though. The LG Optimus 2X still manages to get a lot of good readings, including a flawless frequency response, but its stereo crosstalk increases quite dramatically. 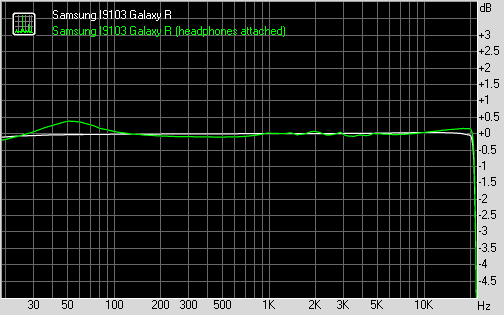 The Samsung Galaxy R on the other hand got more intermodulation distortion and a few very minor issues with its frequency response, but retained better stereo performance. Once again it's quite hard to pick a winner, but we give the Galaxy R our preference due to its better balanced output. You should know that the two will sound identical more often than not though, so you probably shouldn't base your purchasing decision on audio output alone. To sum it up, the two phones are almost tie when it comes to their audio reproduction quality.